› Author Affiliations Funding Medocity, Inc. supported the first 3 months of the study through a contract to the Dana–Farber Cancer Institute. Background Patient-centered symptom assessment and management tools allow patients to perform self-assessments and engage in self-symptom management. Efficacious tools exist for reducing symptom distress; however, little is known about feature-specific use. 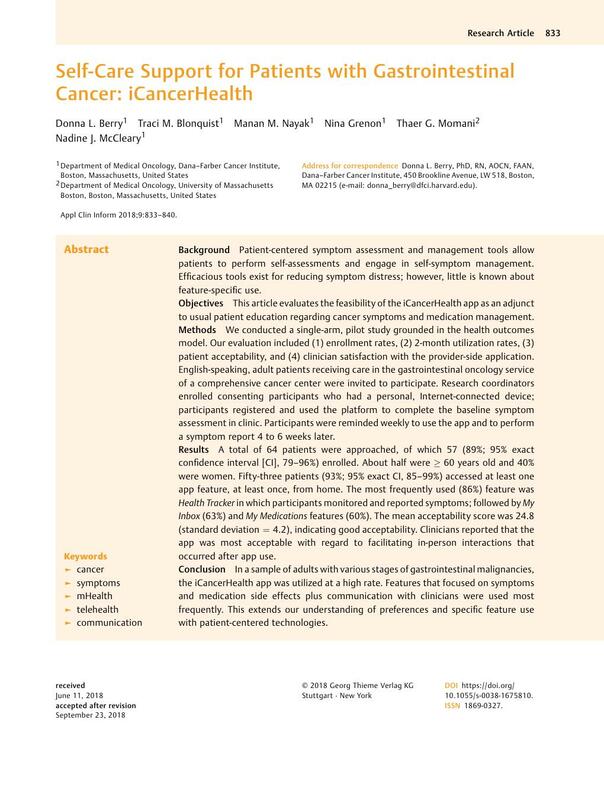 Objectives This article evaluates the feasibility of the iCancerHealth app as an adjunct to usual patient education regarding cancer symptoms and medication management. Methods We conducted a single-arm, pilot study grounded in the health outcomes model. Our evaluation included (1) enrollment rates, (2) 2-month utilization rates, (3) patient acceptability, and (4) clinician satisfaction with the provider-side application. English-speaking, adult patients receiving care in the gastrointestinal oncology service of a comprehensive cancer center were invited to participate. Research coordinators enrolled consenting participants who had a personal, Internet-connected device; participants registered and used the platform to complete the baseline symptom assessment in clinic. Participants were reminded weekly to use the app and to perform a symptom report 4 to 6 weeks later. Results A total of 64 patients were approached, of which 57 (89%; 95% exact confidence interval [CI], 79–96%) enrolled. About half were ≥ 60 years old and 40% were women. Fifty-three patients (93%; 95% exact CI, 85–99%) accessed at least one app feature, at least once, from home. The most frequently used (86%) feature was Health Tracker in which participants monitored and reported symptoms; followed by My Inbox (63%) and My Medications features (60%). The mean acceptability score was 24.8 (standard deviation = 4.2), indicating good acceptability. Clinicians reported that the app was most acceptable with regard to facilitating in-person interactions that occurred after app use. Conclusion In a sample of adults with various stages of gastrointestinal malignancies, the iCancerHealth app was utilized at a high rate. Features that focused on symptoms and medication side effects plus communication with clinicians were used most frequently. This extends our understanding of preferences and specific feature use with patient-centered technologies. This study was approved as minimal risk by the Dana–Farber Cancer Institute Institutional Review Board in Boston, Massachusetts.